Raiders and rumors of raiders panicked the residents of Viewmont. Word came that nearby Darter’s Mill was in flames and that Viewmont would be next. The household spun into action. They loaded all food and clothing onto a wagon… Mrs. Moon gathered all the family silver and jewels. She thrust the treasures into Lottie’s trembling arms with orders to bury them in the orchard. Then the frightened family awaited their doom. But the raiders never came. The dust kicked up by a traveling heard of sheep caused a false alarm. After the War, Lottie was invited to help establish a school for girls in Danville, Kentucky. It was in Danville that Lottie would meet and befriend Miss A.C. Stafford, a Presbyterian. It was not long before the school came to a financial impasse due to handing out too many scholarships and was taken over and renamed by the Presbyterians. Soon a new opportunity presented itself in Carterville, Georgia for both Lottie and Miss Stafford to begin a new school for girls there. The women set to work and were surprisingly met with great success. Yet, just as things seemed to be progressing at the new school, Lottie’s’ mother fell sick and Lottie quickly returned home to Viewmont just in time for her mother’s passing. While back in Viewmont for her mother’s funeral, Lottie had a great deal of time for discussions with her younger sister Edmonia. Edmonia was contemplating missionary service in China. Secretly Lottie and Edmonia had been supporting the mission work in China conducted by Mrs. Martha Foster Crawford, the wife of T. P. Crawford. Now it seemed that through correspondence and application that an opportunity opened up for Edmonia to go as a single woman missionary to China in an effort to reach Chinese women. Charlotte Digges Moon was officially appointed by the Foreign Mission board on July 7, 1873. She began to make plans for her departure by visiting friends and family. 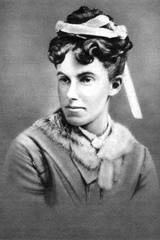 Finally on September 1st of 1873, Lottie Moon set sail from San Francisco for China. The trip from China was eventful. Not far into the ocean voyage, Lottie was plagued with seasickness which lasted twenty-five days until the ship arrived in Japan. After a fair amount of time visiting in Japan, Lottie set out for Shanghai. However, shortly into the voyage the ship encountered a hurricane and only after the passengers and crew had resigned themselves to the prospect of a watery grave was the ship returned safely back into the Japanese harbor. Then when Lottie boarded another ship to take her to the missionary province another typhoon attempted to keep her from her destination. Finally, on October 25, nearly two months since she set out, Lottie Moon arrived in Tengchow. Lottie was excited to be reunited with her younger sister Edmonia. Edmonia had been in China for almost a year-and-a-half before Lottie arrived and had made quick progress with the language. Lottie, a language scholar, was a little slower to catch on, but still a quick learner. She soon mastered the local dialects. Lottie soon progressed to reading Chinese literature and history, mastering the language better than most. Even before Lottie mastered the languages she began taking trips to the surrounding villages with Mrs. Crawford and Edmonia. Just a few short months after her arrival, with the aid of a Chinese woman, Lottie was working on her own. Initially she was met with opposition and was often called names like “foreign devil.” Eventually she learned the culture and was able to operate with a polite directness that earned her favor and credibility with the locals. Ever since Edmonia had arrived in China she had struggled with culture shock. The Crawford’s were unaccustomed to welcoming new missionary members to the team and there was no formal means of transitioning into missionary life. Edmonia was thrown into the mix to sink or swim and by 1876 it was apparent the Edmonia was sinking. Shortly after her arrival in China, she began to suffer a variety of illnesses. First, she was unable to travel with the other women and was confined to work in the mission compound. Then she was sent to Japan to see if a change of scenery would aid in her recovery. While in Japan it was apparent that she needed to go home to Viewmont and Lottie was quickly recalled from China to aid her sister. The Moon women arrived back in Viewmont on December 22, 1876 just in time for Christmas. Allen. The New Lottie Moon Story, 47. Allen. The New Lottie Moon Story, 49. Allen. The New Lottie Moon Story, 63-65. Allen. The New Lottie Moon Story, 70-71. Allen. The New Lottie Moon Story, 79-82. Allen. The New Lottie Moon Story, 94-96. Allen. The New Lottie Moon Story, 96-111.